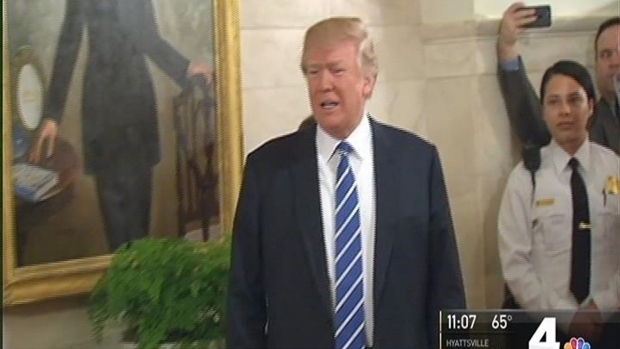 The first tour group to visit the White House since President Donald Trump took office got a big surprise Tuesday -- the president himself said hello. Trump welcomed a small crowd of visitors in the East Wing, waving from behind a velvet rope as the crowd screamed, cheered and took photos. The president pulled Jack Cornish, 10, from Birmingham, Alabama, from the crowd and hugged him as visitors and journalists looked on. The White House, which traditionally halts tours during the transition of administrations, had been closed to tours for six weeks. President Donald Trump surprised a group of visitors to the White House as tours restarted on Tuesday. News4's Justin Finch reports. "I am excited to reopen the White House to the hundreds of thousands of visitors who come each year," first lady Melania Trump said in a statement announcing the resumption of the tours. "The White House is a remarkable and historic site and we are excited to share its beauty and history. I am committed to the restoration and preservation of our nation's most recognizable landmark." The self-guided, free tours are available 7:30 to 11:30 a.m. Tuesday through Thursday, and 7:30 a.m. to 1:30 p.m. Friday and Saturday. Tour hours can be extended when possible, based on the official White House schedule, according to the official website. Tours may be requested up to three months in advance and must be submitted at least 21 days before your visit. Tours are scheduled on a first-come, first-served basis.